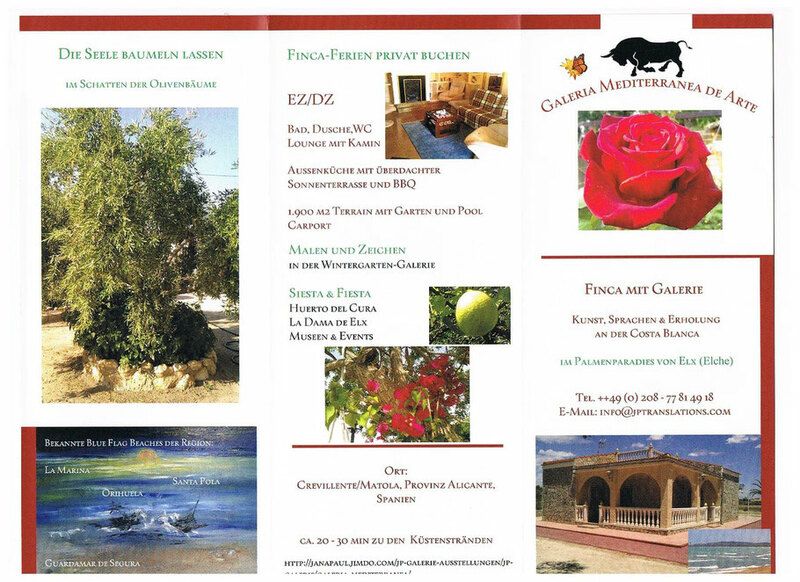 B & B Finca zur Vermietung - janapauls Jimdo-Page! The finca is located in the Crevillente/Matola area, with good connection to main roads and shopping facilities, surrounded by neighbouring properties. The property includes approx. 120 m2 of living area, with a terrace and kitchen, inside and outside toilet, and a carport. In front of the additional outside kitchen, there is a shaded sitting area overviewing the pool of 13 x 6 m2 with a shower area and an attached poolhouse , washing facilities included. There is a BBQ behind the house and also a small baby pool in the garden area. The house contains two master bedrooms and one childrenâ€™s room with two single beds, a spacy lounge with a logfire, and a bathroom with a shower and small tub. The inside kitchen is currently available, however, this will be turned into a large bathroom with a Jacuzzi later. Garden area: 1900 m2 , with olive trees, pomegranates, mandarins and orange as well as lemon and almond trees, bougainvillea and wine in front of the house, natural stone front. Oleander bushes and roses are growing alongside the property that has irrigation the whole year long, including palm trees, bamboo, and cactus. Hammocks available. One of the master bedrooms together with the inside bathroom is for rent. Depending on the season, the children`s room is for rent as well. Our guests may use all the facilities of the property except for one private room. TV/Sat: will be available soon, depending on the telecoms company. For the moment, we recommend a Spanish SIM-card for independent laptop use via mobile phone.